Rutherford Hayes was the 19th President of the United States who served in office from March 4, 1877 to March 4, 1881. What was the life of Rutherford Hayes like? The short biography of President Rutherford Hayes covers important information and facts about his early life, his family, career and the famous events and achievements of his political life. Our short biography of Rutherford Hayes provides an interesting and easy way to learn about the life of the President. 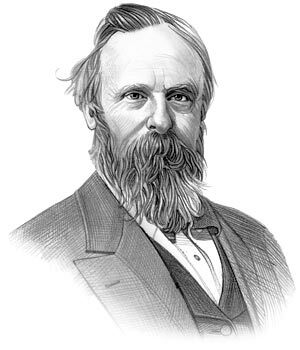 The following important facts provide a fast overview of important facts about President Rutherford Hayes. Facts and Info: Rutherford B. Hayes was the 19th president of America who won the election by just one electoral vote. He ended Reconstruction in the South recalling the troops and allowing the South to govern itself. For additional info refer to 20 Facts about Rutherford Hayes. Facts and Info: The career of Rutherford B Hayes included the roles of Lawyer, Soldier, Politician and Statesman. He was well educated at Kenyon College and Harvard Law School. He became the 19th president of America in 1877 during Reconstruction and served for 4 years until 1881. Reconstruction was the system of bringing the Southern states back into the Unites States after the Civil War. Facts and Info: Rutherford B Hayes married Lucy Ware Webb on December 30, 1852. Lucy Hayes was the first president's wife to be called First Lady of the Land. She was unkindly given the nickname "Lemonade Lucy" because she strongly supported the temperance movement. Rutherford Hayes and his wife Lucy had 8 children. Facts and Info: Rutherford B. Hayes belonged to the Whig Political Party. The Whig political party operated from the early 1830s to the mid-1850s in opposition to the Democratic Party and favored a program of modernization, economic protectionism and opposed tyranny. Hayes was 54 years old when he was inaugurated as the 19th president. Wheeler stood as the Vice president. For additional facts refer to his Presidential Cabinet members. Short Biography of Rutherford Hayes: What he was like! Facts and Info: Rutherford B Hayes was 5 feet 8.5 inches in height and weighed 170 to 180 lbs. He had dark brown hair which turned white, deep set blue eyes and wore a full beard. He dressed simply, often in ill-fitting clothes. He was raised by his widowed mother and was wounded five times in the war. His nickname was Granny Hayes as he did not drink, smoke or gamble and maintained a very strait-laced White House. Facts and Info: During his lifetime he played a key role in important events of the era. Rutherford B Hayes was instrumental in the Compromise of 1877 which heralded the end of Reconstruction. Passing of the Bland-Allison Act which de-monetized silver and tied the nation's monetary system firmly to the gold standard. And in 1880 he pronounced the necessity of creating an American controlled canal in Panama. Facts and Info: Rutherford B Hayes died of a of heart attack on January 17, 1893 in Fremont, Ohio and was buried in Spiegel Grove State Park. The following year the Hayes Commemorative Library and Museum was opened on the site, funded by contributions from the state of Ohio and Hayes' family. The short biography of Rutherford Hayes provides a fast overview of the key facts and events about his life and the accomplishments of his presidential term in office. The following Rutherford Hayes video enables you to sit back and listen to the history of his personal and political life - a useful educational resource for kids, children and schools learning about the life of President Rutherford Hayes.